Hi and happy Tuesday! 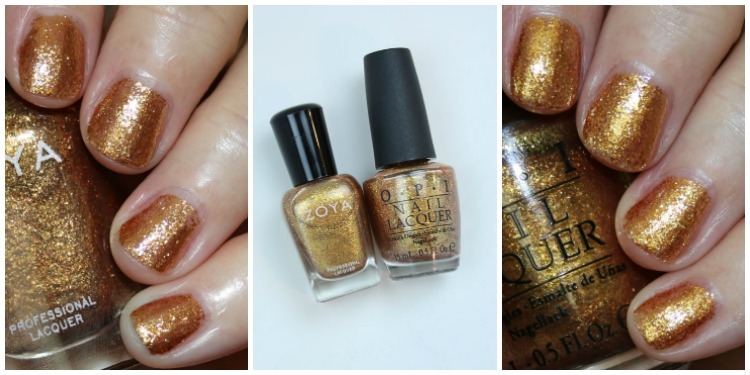 Today I have the requested Zoya Astrid and OPI Goldeneye comparison for ya! 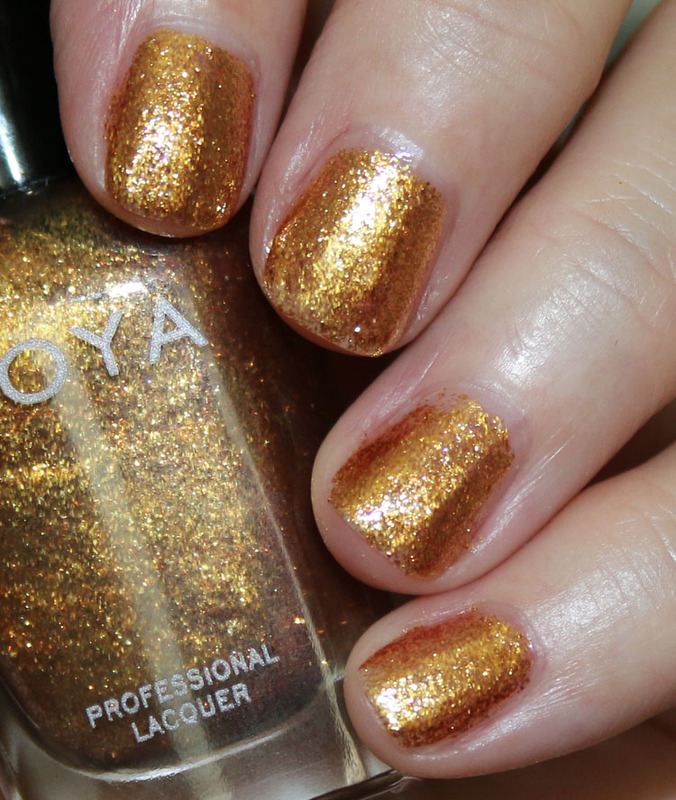 Zoya Astrid and OPI Goldeneye are both warm-toned gold foil shades, so it makes sense that they might be dupes. 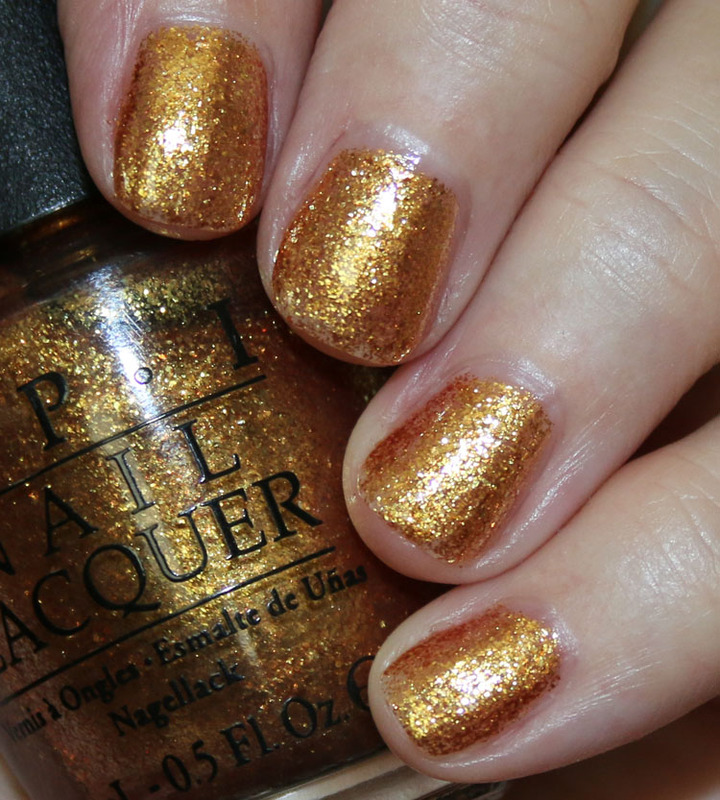 Goldeneye came out in the Skyfall 2012 Collection, and Astrid just came out in the Jubilee Holiday Collection. Zoya Astrid. This is two coats. OPI Goldeneye. This is three coats. Here I have Zoya Astrid on my ring & pointer nails and OPI Goldeneye on my pinky & middle nails. As you can see they look pretty identical. Both have that “old antique gold” look to them and both are super glittery foils. You could do two or three coats with them also, depending on how thick/thin you go. Interestingly when you see them side by side in these photos they don’t look quite as identical as when they are next to each other on my nails. I think it’s mainly because of factors that go into the time of day I took the photos, my hand angle, etc. Goldeneye looks a little more warm but really, it’s basically a dupe for Astrid, in my opinion. Are these close enough for you to consider them dupes? On the nail, they look identical to me. I’d definitely consider them a dupe. Yeah! To my eye they are dupes. Beautiful, but I wouldn’t buy both. I’d have to go by which has the better application. I loved Goldeneye… and then I dropped my bottle all over the bathroom floor. I’m happy to know there’s a dupe available!